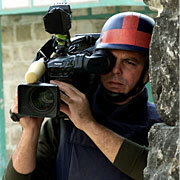 While U.S. officials downplayed any sense of crisis over the situation in Fallujah or the unprecedented crackdown against the Mahdi, and Bush insisted that Washington would "stay the course" on Iraq, including handing over sovereignty to an interim government June 30, others -- both for and against U.S. designs in Iraq -- depicted a much more dire scenario. Will The 9/11 Panel Dare Probe The Bush-Saudi Connections? Too little, too late for monarchy? 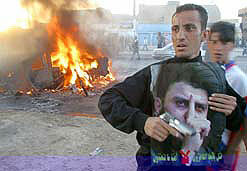 WHAT TRIGGERED THE SHIITE INSURRECTION? "The major problem that Iraqi people suffer from is random capture by the U.S. military"
Now looking for intention to have a "breakout production capacity"
Haiti Jails One Rebel Murderer -- But For How Long? Raw sewage still flows into rivers, despite $3.2B spent by U.S.
"Nobody knows what people were exposed to"
"If Bush wanted to truly unite us and not divide us, this is the last nominee he would send us"
Israeli nuclear whistleblower Mordechai Vanunu was freed after serving an 18-year jail term for revealing Israel's nuclear secrets to the British media. Despite severe restrictions clamped upon him by Israel's security establishment even after his release, Vanunu immediately spoke out against the state, and made clear he intends to pursue his campaign against Israel's weapons of mass destruction. "To all those who are calling me a traitor, I am saying I am proud and happy to [have done] what I did." His evidence demonstrated that Israel had developed up to two hundred nuclear weapons of a highly advanced design, making it the world's sixth-largest nuclear power. For his efforts, agents from the Mossad, Israel's intelligence service, kidnapped him from Rome and brought him to Israel to stand before a secret tribunal that convicted him on charges of espionage and treason. Much of his prison time was spent in solitary confinement. Supporters and opponents gathered outside the prison to witness Vanunu's release. 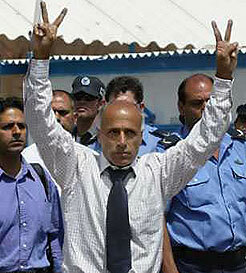 Vanunu waved and flashed "V-for-victory" signs as he walked through the gates of the Shikma prison in the coastal Israeli town of Ashkelon. Before a crowd of reporters, he defiantly proclaimed that he remained proud of his actions The 49-year-old former nuclear technician today described his treatment by Israeli security agents while in prison as "cruel and barbaric." "I say to the [Israeli security services], you didn't succeed to break me...you didn't succeed to make me crazy," he said. "The [goal] of 18 years of isolation is to make me crazy." Come November, Will Bush Blame The Birders? Country Joe Band, 2004: "Uncle Sam Needs Your Help Again"